We can do plaques up to about 10" X 10" out of aluminum or bronze. Bronze is usually about 25% more than the aluminum. To make a pattern we have found that the best way is to use photo-engraving. Just provide us with a black and white drawing and we will take to an engravers to get an acid etched 3-D pattern made. To get the best plaques, we need block letters and not too much detail in the design. Script, Cursive or Old English fonts with thin lines do not work well. Do not use fonts that create small holes in the "e"'s or "a"'s. It works best if all lines in the artwork or lettering are at least 1/8" thick. The entire drawing must be black and white in order to work for photo engraving. PLEASE follow these guidelines- Most drawings we see are not acceptable the first time we see them. We can then use the 1/4" thick pattern to make as many plaques as you need. We do not do any painting or powder coating unless you order more than 50. The price for powder coating is usually about $4 per plaque. For a standard car club plaque (5" X 8") it is about $100 for the pattern and then $18 for each aluminum plaque. 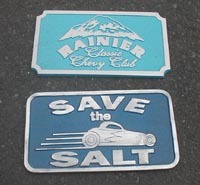 We can also copy original car club plaques for $18 and you don't have to pay the pattern costs.